The thermoforming machinery sector has been churning out new developments from WM Thermoforming; Gabler Thermoform; OMG, GN Thermforming and Kiefel. Switzerland-based WM Thermoforming Machines, at the PlastMilan show in May, showcased its new FC 780 E IM2 continuous thermoforming machine. 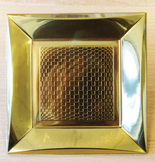 It has a maximum mould size of 780 × 580 mm and a maximum draw depth of 130 mm. This fully electric servo-powered unit, including the clamp frame, comes with vacuum and high-pressure forming with steel-rule cutting in the forming tool plus an additional in-line cutting press and in-line stacking. With an additional servo axis, the machine is said to be more flexible, as well as suitable for use in cleanroom applications. WM says it has done away with the more common vacuum pump to include multiple venturi stages, thereby reducing maintenance. Further maintenance savings are achieved by eliminating linear transducers for absolute encoders, which are said to be more precise and reliable. At Plast, it was shown producing a 230 x 230 mm square plate in a six-cavity mould, in a production of 13,700 plates/hour. An advantage, the firm said, is that the 75-tonne IM station allows to form and cut the product in the same forming station or to make the cut in a second station in line. This machine also uses new black ceramic heaters that are said to allow for 10-12% energy savings with PET and 12-15% savings with PP. Remote service is available from Switzerland, whereby WM technicians can directly access the thermoformer control via the internet. Elsewhere, Gabler Thermoform showcased its new M100 at the Florida-held NPE show in May. It is billed as a revolutionary new tilt-bed machine, offering output increases of up to 50%, or 180,000 standard cups/hour, compared with current industry standards. It combines forming and cutting in one production step, unlike the post-trim processes with free freely suspended cup-foil rolls and rapid-punching and stacking cycles. A completely re-engineered forming station with the latest drive and guide technology provides a forming area of 1130 x 550 mm. Gabler says the M100 combines both performance and technology, while reducing energy consumption. Other features include a user-friendly touchscreen, reverse-stacker automation, Gabler’s SpeedFlow forming-air system, and improved production-monitoring and process-optimisation features. Also at the NPE show, Italy’s OMG showcased its all-inclusive servo-driven thermoformer, which was shown thermoforming 100% compostable crystallised CPLA food trays using materials supplied by Advanced Extrusion Inc (AEI). The electric OMG thermoformer produces finished parts by way of precision rule-die trimming on a heavy-duty tonnage four-post, servo-driven trim press. Parts such as food trays, lids, containers, cups, and clamshells are loaded onto an auto-stackingcounting station, an integral part of the OMG thermoforming system. Parts are then mechanically discharged onto a final packing station. OMG also demonstrated the machine thermoforming AEI’s CPET, using the same single-stage tooling used for the CPLA tray. Both materials incorporate a nucleating agent to promote accelerated crystallisation during the thermoforming process. Meanwhile, working closely with its parent company Kiefel, Bosch Sprang has developed new patent-pending thermoforming tooling for producing PP coffee pods with a material density of lower than 1 kg/cu m, allowing them to be recycled in water-separation systems. The new tooling system has been statistically analysed as well as tested and can be adapted to most tilting bed style thermoforming machines, the companies say. Consequently, it does not require any special machine adaptions. The proprietary technology is based on several unique and innovative multi-functional elements in the tool that enable and control specific mechanical properties of the coffee cups. The production line is based on a Kiefel KTR 6.1 Speed, a Bosch Sprang 91-cavity tool and Mould & Matic downstream equipment. With its production capacity around 1 billion cups/year (24/7) this production system represents Kiefel’s ability to provide turnkey solutions, says the German firm. Sweden’s Rapid Granulator has introduced a new range of granulators designed specifically to process skeletal waste in-line from thermoforming lines. The ThermoPRO series handles sheet widths from 600 to 1,500 mm and is available in standard and low-built formats. It is said to combine features already proven on other Rapid granulators such as the double-scissors cutting action; “openheart” design for fast production changeovers and ease of maintenance; mineral composite base for high stability and low noise. 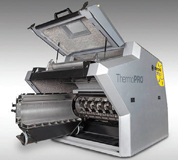 The ThermoPRO uses a heavy-duty roller feed as standard, enabling problem-free handling of the skeletal waste, adds Rapid. This even makes it possible to run several webs into the granulator at the same time. It also facilitates granulation at the start-up of a thermoforming line, when the parts are not stamped out of the sheet, meaning that the entire web, trim and parts together, needs to be fed into the granulator. Canada’s GN Thermoforming Equipment says it has received multiple orders from US and Canadian processors for its new GN800 thermoformer, since its showing at the NPE, according to Jerome Romkey, GN’s Vice-President of Sales and Foreign Operations. GN received orders for six units and expects further increased business activity over the next several months in the US, Mexico, and the Caribbean, said Romkey, adding that the thermoformer is currently targeted for food, medical, and industrial packaging. The GN800 offers standard features including forming capability of 5-in above and below the sheet line, in-mouldcut capability, auto-grease, heavy-duty bearings in the toggle system, and Solar heaters. Plus, it is designed to work with minimal thicknesses of plastic materials and in combination with the common-edge system, increasing finished part output/kg of material. The 75-tonne GN800 has a forming area of 830 mm x 570 mm, plus additional space between the forming and cutting stations, providing extra cooling time when running heavier gauge materials or PP. The company has also expanded its presence in Asia by furthering its agreement with current Chinese agent Vulcan Plastics Technology. Along with covering China and Taiwan, Shenzhen-based Vulcan, a manufacturer of thermoforming moulds and cutting dies, will sell GN’s entire thermoforming machinery in Vietnam, the Philippines, Indonesia, Malaysia, Thailand and Singapore. Meanwhile, US private investment firm Graham Partners has made its third investment in the thermoformed packaging sector with the acquisition of Nuconic Packaging this year. This investment was completed less than a year after the acquisitions of Tray-Pak Corp. and EasyPak. Graham says this attractive niche market is benefitting from increasing consumer demand for sustainable packaging options and freshly prepared, on-the-go meals, and, thus, the latest acquisition. Nuconic is a supplier of thermoformed PET packaging serving the food market, a product line that complements EasyPak and Tray-Pak. It also brings a unique approach to product and tool design, said Graham Partners, which will allow the combined platform to deliver an expanded offering to the market. In addition, Nuconic will expand the combined company’s footprint to the West Coast of the US, which is expected to be a key growth area. Graham Partners targets companies with EBITDA between US$5 million and US$50 million, and says it will invest in smaller companies so that they complement one or more of its other investments.